An RSS feed (or news feed) is a means by which you can stay informed about what's going on at Canberra Chordsmen without having to regularly visit the website. Dan’s infatuation with music began at age 10 when he started private piano lessons. Soon after he began playing guitar and singing too in highschool, music being by far his favourite subject. Dan moved from his hometown Moruya, NSW to Canberra in 2009 to study his Bachelor of Education – Secondary Teaching (Music), which he completed in 2013. Now he teaches music privately and in schools around Canberra to pay the rent (and because he loves it of course!). Dan found barbershop while he was studying in 2011. After Googling ‘choirs in Canberra’ he found the city’s only men’s barbershop chorus – The Canberra Chordsmen! Until then, Dan had only seen barbershop singing on The Simpsons. Intrigued, he visited the chorus and immediately felt at home among the barbershoppers and the close, ringing chords. Dan became the full-time director of the group in October 2013, but not before learning the craft from the two previous directors, Chris Drury and Glenda Lloyd. Chris gave Dan the warm welcome to barbershop that got him hooked, and Glenda was an invaluable mentor to Dan in all aspects of running a barbershop club. 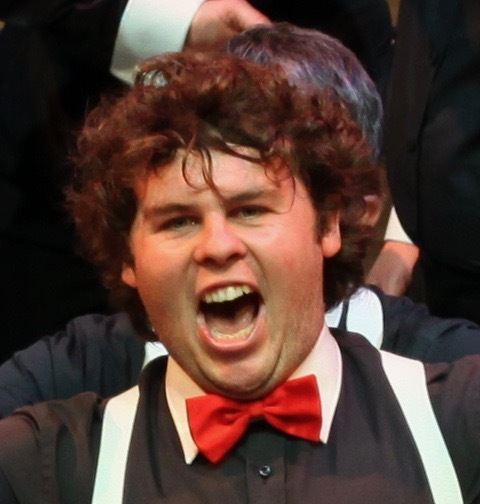 Dan looks forward to the future of barbershop harmony in Canberra and the positive impact it can have on the lives of the men who sing with us and on all of our audiences. Dan is particularly keen on youth development as he was 20 when he joined the club. Sign up for our newsletter to receive very occasional updates from us about upcoming events. Canberra Chordsmen is committed to protecting your personal data and will use any personal or sensitive data we collect from you. In Europe, this is in line with the General Data Protection Regulations (GDPR). Canberra Chordsmen collects data from individuals to help us plan, organise and run the day-to-day operations of the group (e.g. co-ordinating rehearsals or collecting subscription payments) and to promote and market the group’s activities (e.g. marketing mailing lists and photography/video capture). This data will be used by our admin team to manage your membership with Canberra Chordsmen and to organise and run our activities. When you sign-up to our marketing mailing list we will ask for your email address and will use this data to send you information about our events and activities (e.g. upcoming events, latest news, etc). We will only send you information that is related to Canberra Chordsmen. (i.e. we will not use your data to send you marketing messages from 3rd parties). If you purchase an event ticket, or Canberra Chordsmen merchandise, or make a donation, we need to collect data on the person making the purchase. This data will only be used for administering your booking/purchase/donation, and will not be used to send you marketing/promotional messages from the group. The Canberra Chordsmen data retention policy is to review all data held on individuals at least every two years and remove data where we no longer have a legitimate reason to keep it.